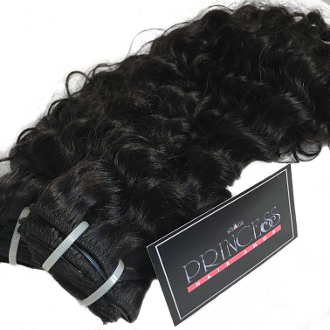 Our Products >> Malaysian Curly Clip In Extensions 18"-22"
This hair is reported to have minimal shedding, but a normal amount of shedding for curly textures. Because of its curly texture, this hair requires lots of moisture and maintenance. Each day you will need to activate the curls with a water/conditioner mix and condition it with a moisturizing conditiner often. This texture is best for someone experienced with both Virgin and curly hair textures. If this is your first Virgin or curly hair purchase, its recommended that you start with only two bundles until you acquire and are comfortable with your curly hair regimen. In comparison to Brazilian and Peruvian curly hair, this texture is the finest; but still textured enough to blend well with natural and relaxed textures. Malaysian Curly Clip In Extensions 18"-22"